Featuring 200 cards. Shop for base sets on eBay. Featuring 25 cards. Click here for a detailed guide including images of every card. 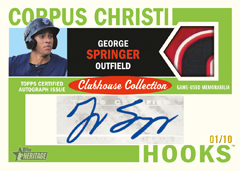 2013 Topps Heritage Minor League Baseball takes an old design and applies it to baseball's future stars. Like the MLB set, the cards are largely inspired by 1964 Topps Baseball but with a handful of modern twists. 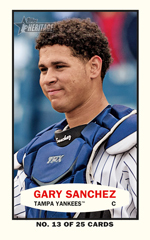 The 2013 Topps Heritage Minor League Baseball set has 225 cards. The final 25 are short prints, long a popular Heritage feature. Twenty-five players also have variations. Base set parallels include Black (#/96), Venezuelan, Blue (1/1) and Printing Plates. Real One Autographs fall two per box. Besides basic versions, colorful parallels include Black (#/35), Red (#/10), Orange (#/5) and Blue (1/1). There are also Autographed Printing Plates. Dual Real One Autographs come with a pair of signatures and are numbered to 15. 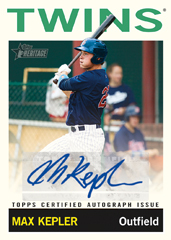 It is worth noting that while the major league version of Heritage emphasizes on-card autographs, 2013 Topps Heritage Minor League Baseball includes sticker autographs. Relics combine to fall one per box.Clubhouse Collection Relics come with pieces of game-used gear and equipment. Black (#/50) and Blue (1/1) parallels add rarer versions to the mix. High-end game-used cards include Clubhouse Collection Dual Relics (#/25), Patches (#/15) and Autographed Patches (#/10). Popular Manufactured Hat Patches return as well. 2013 Topps Heritage Minor League Baseball has a pair of basic insert sets as well. 1964 Bazooka uses another classic design for today's minor league standouts. Road to the Show highlights players as they make the journey up the MiLB ranks. The release is capped off with a pair of prize redemptions. 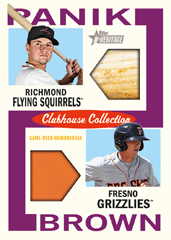 The first is for uncut sheets of 2013 Topps Heritage Minor League Baseball cards. The Make Your Pro Debut program returns with the winner getting the chance to sign a special contract with a MiLB team and get their own 2014 Topps Pro Debut Baseball card. Good: Two autographs per box. Lots of parallels. Low price. Prospects galore. Bad: Many players will not make the big leagues. Card design is nothing fancy. The Bottom Line: I would consider 2013 Topps Heritage Minor League Baseball to be a product that a lot of collectors would want to purchase. The cost is relatively inexpensive, the number of hits are attractive, and the appeal of getting future stars make it exciting. The card design has a retro throwback feel, which is the norm for a Heritage product. The simple pictures are a combination of action and still shots. Card back have a nice layout with the name of the affiliate in the bottom corner, which is helpful for those who do not know all the minor league teams. The cards are moderately thick and durable. The base parallels include a black border, which is the most common, and a rare blue border. I personally find the black border to be a nice contrast to the traditional base design. The colors pop and it gives a more modern look while still holding on to some of the traditional Heritage appeal. The 1964 Bazooka inserts leave a lot to be desired. This was not a very promising look back in the day, and adding modern players to the same look doesn't do much for me. I find the smaller mini cards to be difficult to keep in a box or plastic sleeves, so I would much prefer these cards were not in the set. The dual relics are the nicest cards in the set. The two relics on one card connected by a color border definitely stand out. The only drawback, in my opinion, is the fact that it only has the last name on the front of the card. Other than that, I find it difficult to find any fault in these cards. The layout of the autographed patches has the same type of look as the relic. The only difference is that the second relic is replaced by the logo for the top part and the autograph on the lower section. It is very basic yet bold. Dual autographs are set against a yellow backdrop, which, to me, really takes away from the autograph. The yellow is too bright compared to the blues, reds, and blacks, which flow a little better with the cards. The Road to the Show cards are another favorite. I love the black color, the multiple logos of the different minor league affiliates, and the story aspect of the card. The card back allows you to really connect with the player and see where he played. If you are a fan of a particular minor team or if you have a local minor league team, this can add even more to the story of the player with a hometown feel. The base set has 200 cards with many parallels, inserts, plates, relics, and autographs. There are also short prints, variations, and the 1964 Bazooka set. If you are a collector of mini cards and remakes, you will probably like these cards. The Road to the Show cards are probably one of the lesser hits in the collection. However, I really like these cards. Following in the historical aspect, these cards show how a player made it to where they have. It includes the emblem of all the Single-A, Double-A, and Triple-A teams they played for. The best hit of the box, in my opinion, belongs to the Real One Autographs. 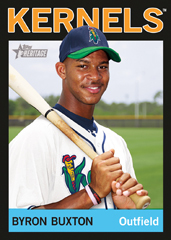 I think the value in 2013 Topps Heritage Minor League Baseball is phenomenal. A box runs around $50 and you can probably pick up a pack in the $2-$3 range. The amount of different cards with all the parallels, inserts, relics, and variations makes this well worth the money. This box was a lot of fun to open. Looking for the hits, favorite teams, and future stars makes this a fun set to collect. The only small downside is the fact that most of the players in the set are unknowns. Nevertheless, it is a great addition. Wonder what system that Topps uses to pick players. Rymer Lirano went on the DL before Spring Training in 2013 and didn’t play this year. Cody Buckel performed so poorly at Double-A that he was sent to Extended Spring Training in May and never returned to a full season team. CARD #183 CAME WITH A BLACK BACK WHERE ALL THE OTHERS WERE ORANGE. CHARLES TOMASINO � Cards with black backs are Venezuelan parallels. I felt the single player autographs were very weak this year. They should focus more on the top 100 prospects and Top 100 being drafted that year for autographs. Printing plates and patch autos were really good. The quality and design are excellent, however, when it’s all said and done it’s just a wicked marketing ploy on the part of Topps. Like in the Pro Debut set there is only one hot autograph (Buxton, in this case) so even though there are 2 autographs per hobby box only one out of the 25 available carries any weight with collectors. 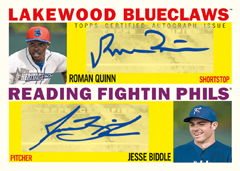 Why not Taijuan Walker or Oscar Taveras or Jorge Soler autos? Why is Billy Hamilton only featured in a relic card? My theory around the selection process is that it is purposefully designed to create a sizeable rift between a small handful of valuable cards and the rest.